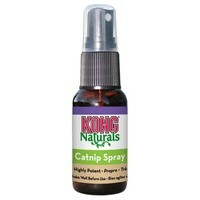 Kong Naturals Catnip Spray 30ml is concentrated oil specially designed to ensure maximum fun is achieved by your cat. Made from steam distilled North American catnip for the highest of potency, this oil is great for spraying on toys, teasers and scratchers to made your cat go wild with excitement. With all natural ingredients, this fantastic catnip spray will bring out the feline instincts in your cat, providing fun with a purpose! Small, potent, with the best price at VetUK! My cats are pretty keen on this. I've found it's a good way to refresh old cat toys - ones they'd given up playing with are popular again once spritzed! My neighbour's cat likes it too.